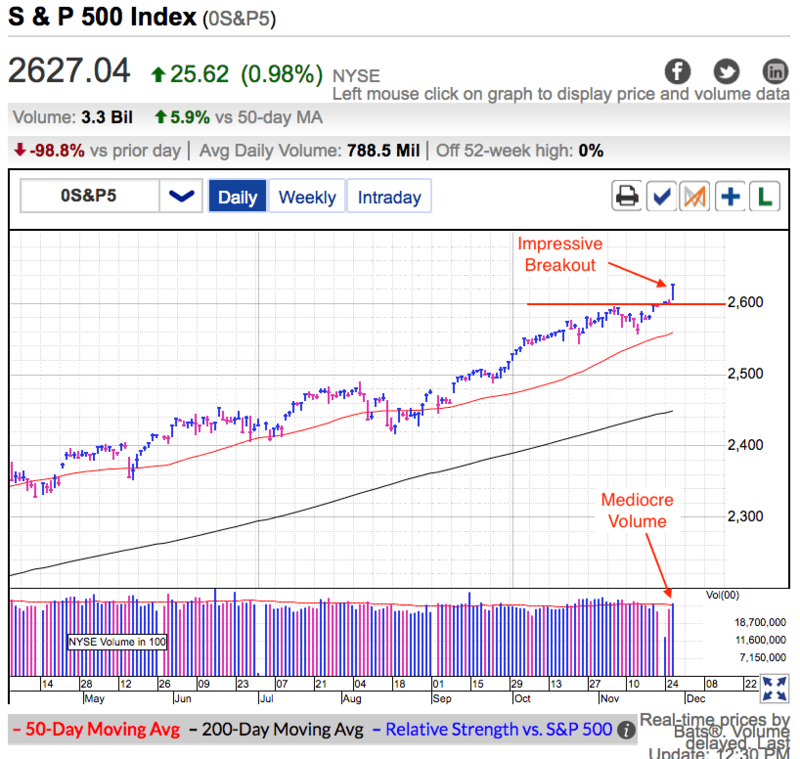 On Thursday the S&P500 surged higher and extended its breakout above 2,600. John McCain endorsed the Senate’s Tax Reform bill and that put traders in a buying mood. McCain’s objection derailed Healthcare Reform earlier in the year, so his support this time around is seen as a big deal. That leaves five undecided Senators remaining and Republicans need to persuade at least three more. Of course a lot changes in a few hours. Not long after the market closed, Tax Reform took a serious hit when deficit hawks failed to get the debt triggers they are insisting on. With only two votes to spare, it doesn’t take much to put the entire bill in jeopardy. This latest wrinkle was weighing on overnight S&P500 futures, which already gave back half of Thursday’s gains. Easy come, easy go. It will be interesting to see how the market responds to these headlines during Friday’s regular-hours trade. Even though futures are lower, the broad market has largely given Republicans a pass every time they ran into a problem. There have been several other stumbles along the way, but stocks remained stubbornly near all-time highs. As long as traders keep giving the benefit of doubt to Republicans, we shouldn’t expect too large of a reaction on Friday. These are the type of disagreements I’ve been expecting from our politicians, but thus far the market hasn’t worried about it. If the market doesn’t care, then we don’t need to care. We are coming to the final weeks of 2017 and underweight money managers are being pressured to chase prices into year-end. Their buying combined with confident owners keeping supply tight will help the market continue drifting higher over the next few weeks. The only thing that matters is Tax Reform and the only thing that can dent this optimistic market is Tax Reform failing. Anything short of an outright failure and the market will continue with its half-full outlook. This is definitely a buy-and-hold market and long-term investors should stick with their favorite positions. Things are a little more challenging for traders because the lack of volatility limits swing-trading opportunities. But that’s the way it goes. Sometimes buy-and-hold works better, other times trading in and out of the market is the way to go. This is why I have my money diversified between long-term investments and a trading account. One works great when the other struggles and vice-versa. That means I always have something that is working. I’m leaving my long-term investments alone, but my trading account is sitting in cash. I could buy-and-hold in my trading account too, but that defeats the purpose of having a trading account. Instead, I’m leaving it in cash so that I am able to jump on the next trading opportunity that comes along. We can only buy the dip if we have cash. The most interesting opportunity would be if this Republican infighting spooks the market and gives us a larger tradable dip. Until then I will enjoy the drift higher while waiting for a better trade. A person would have to live under a rock if they haven’t heard Bitcoin breached the psychologically significant $10,000 barrier today. What started as a libertarian experiment a few years ago has gone mainstream. It launched as a proof of concept. Morphed into drug dealers’ favorite payment tool. And has now become the latest speculation frenzy. And what a frenzy it has been, up well over 1,000% this year alone. Everyone expects it to keep running and so far everyone has been right. The financial media barely acknowledged Bitcoin 12-months ago. Now every financial outlet devotes significant coverage to cryptocurrencies. Given how strongly prices shot up, it isn’t a surprise everyone wants to get in. And so far everyone is getting rich. Despite plunging more than 50% half a dozen times over the last several years, it keeps coming back. Jump in any BTC forum and fanatics acknowledge and expect this volatility. But they are not worried because every dip bounces. Rather than fear the next dip, they cheer because it allows them to load up on even more BTC. Bubbles happen all the time. Dot-com stocks, real estate, oil, gold, and even Dutch tulips. It doesn’t matter what it is, if people are making money on it, others want to get in. Humans are herd animals and we cannot help but be infected by the enthusiasm of the crowd. What starts as a good idea often spirals into a buying frenzy where greed conquers common sense. People are more worried about being left behind than what could go wrong. While everyone is getting rich in Bitcoin, unfortunately it won’t end that way. Read accounts of any financial bubble and it always lays waste to everyone who believed in it. And sometimes it goes even further and takes out entire economies. There were a lot of dot-com millionaires in 1999, but there were very few dot-com millionaires in 2002. For every millionaire who survived the dot-com bust, there were a thousand who ended in tears. It was no different in real estate. Lots of real estate millionaires in 2006. In 2009 most of those millionaires were financially ruined. And Bitcoin will be no different. Those who are most excited about BTC’s rise will be the same ones who bear the brunt of its collapse. The psychology that inflates bubbles is also what makes them so destructive. Right now the only mistake anyone made in BTC was selling. This goes all the way to the beginning when someone paid 10,000 Bitcoins for two pizzas. In today’s prices that is $50 million per pizza!!! And the same feelings of regret are felt by anyone who sold at $100, $500, $1,000, and $5,000. 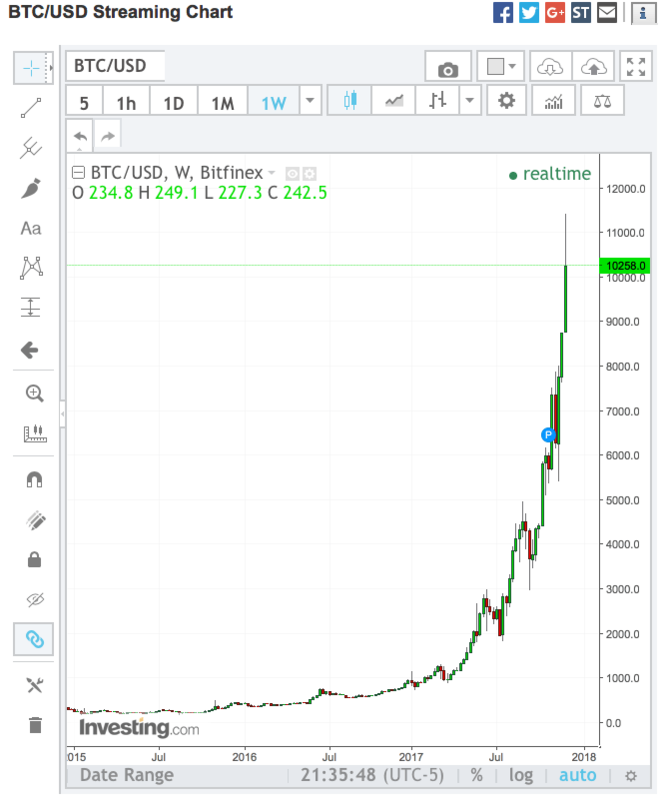 If there has been one thing anyone learned trading Bitcoin is that you never, ever sell because it always goes higher. And to this point that has been correct. Now don’t get me wrong. I’m most definitely not calling this a top because bubbles always go so much further than anyone thinks possible. And to be honest, I thought Bitcoin was overpriced when it was $100 several years ago. While I don’t know when BTC will top, I do know a top is coming because it always comes. Maybe we peaked today, or maybe we peak at $50,000 or even $100,000. I don’t know and it really doesn’t matter how high it goes. That’s because almost no one will get out at the top and everyone who rode the ride higher, will ride it back down again. The same behavior that turned people into BTC, real estate, and tulip millionaires is the same behavior that will cause them to lose everything in the crash. The most successful BTC investors are the ones who held through every dip and even had the courage to add more. While that approach works brilliantly on the way up, it is suicide on the way down. Those who were lucky enough to take profits near the top will be seduced into buying the dip so they can make even more money on the next bounce. Between riding prices down and reinvesting in the dips, most of the people who made money on the way up will give it all back on the way down. That’s the way every bubble ends and this one will be no different. Good luck. If you found this post useful, share it with your friends, colleagues, and followers! If you want to be notified when new posts are published, sign up for Free Email Alerts. 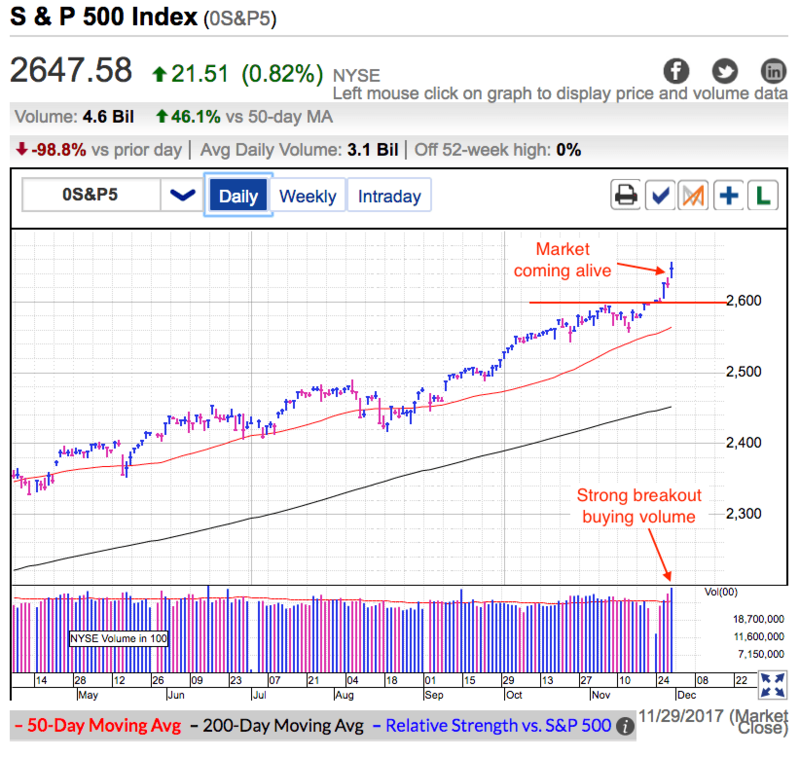 On Tuesday the S&P500 surged to record highs in the biggest up-day in several months. As strong as the price gains were, volume was barely average. But light trade isn’t a huge surprise since we just returned from the Thanksgiving holiday. A big chunk of Tuesday’s enthusiasm stemmed from a Senate committee clearing the way for a vote on a revised Tax bill. Progress is encouraging and that put traders in a buying mood. These gains were especially significant since this was the first material breakout in months. Previous attempts were met with apathy and momentum fizzled within hours. This time buying lasted all day and even withstood another North Korean missile test. Today’s gains keep this market creeping higher. As I’ve been saying for weeks, if this market was going to crumble, it would have happened by now. Confident owners are keeping supply extremely tight as they refuse to sell any negative headlines or bearish price-action. The resulting tight supply makes it easy for even modest demand to keep pushing prices higher. Underweight money managers have been patiently waiting for a pullback that is refusing to materialize. With year-end just weeks away, many of these managers are being pressured to chase prices higher or else they risk looking foolish when they report to their investors. Their desperate buying will likely keep a bid under this market and keep pushing us higher in the final weeks of the year. Even though the path of least resistance is clearly higher, this is still a risky place to be adding new positions. Risk is a function of height, making this the riskiest time in months to be adding new money. Confident owners are demanding premium prices and that leaves new buyers with little margin for error. Even though Tax Reform is making progress through Congress, politics is an ugly process and without a doubt there will be bumps and roadblocks along the way. These near-term gyrations will give recent buyers heartburn when prices dip under their buy-points. 2017 has most definitely been a buy-and-hold year. The largest dips barely registered more than a few percent. This lack of volatility has made it a very challenging year for traders. But that is just the way this goes. Traders do well in sideways and down years, investors do well in steady climbs higher. This is why everyone should diversify their market exposure across both short-term trading and long-term investments. One will do well when the other is struggling. While this has been a great year for buy-and-hold, chances are volatility will return in 2018. Just when the crowd gets used to the market’s mood, it changes. Once tax reform passes, the market’s attention will shift to whatever comes next. Given all the good news that has been priced in over the last 12-months, it is inevitable we will come across something that doesn’t go as well as expected. Markets go up and markets go down, that’s what they do. The higher we go over the near-term, the closer we get to the top. Remember, markets top when the outlook is the most bullish. I’m not predicting anything imminent, but I’m certain 2018 won’t be as easy for investors as 2017. While there are many different strategies in trading, there is only one way to make money, selling our winners. As obvious as that sounds, all too often people forget this fact, especially during periods when prices have done nothing but go up. A person feels wealthy when they own a bunch of expensive stocks. But this person doesn’t have money, they have stocks. And the quirky thing about stocks is they are only worth what someone else is willing to pay for them. Same goes for any other asset whether it is real estate, commodities, or cryptocurrencies. If a person has 50 bitcoin, it would be easy to assume that person has half a million dollars at BTC’s current price of nearly $10k each. But that person doesn’t have half a million dollars, they have 50 bitcoins. The person only has half a million dollars if they sell their bitcoin for $10k each. After prolonged rallies people naturally become emotionally attached to a position that has done really well. They held through several dips along the way and were rewarded for their patience when the stock rebounded even higher. This positive feedback loop encourages long-term holders to keep holding no matter what. But the thing to remember is every dip bounces……until the one that doesn’t. Markets overshoot. That’s what they do. The hotter the stock or commodity, the larger the overshoot. That’s because people love chasing winners. They see other people making money and want to jump on the bandwagon. Who doesn’t love a good bandwagon? What starts as a fundamentally sound investment quickly turns into pure speculation. After a while gets to a place where even the most optimistic fundamentals cannot support the current market price. But it doesn’t matter because people are no longer buying it because of the fundamentals. They are buying it because the price keeps going up. Buyers assume someone else will come along and pay even higher prices. This happened in internet stocks, real estate, oil, 3D printing stocks, and now it is happening in cryptocurrencies. Disagree with me all you want, but people are not buying BTC because of the underlying fundamentals. They are buying it because it doubled in price this month. At some point we run out of new fools willing to pay even higher prices and that is when the house of cards collapses. But it gets worse. What started as an irrational overshoot to the upside quickly turns into an irrational overshoot to the downside. When these bubbles finally pop, prices plunge an average of 80%. That’s not speculation, that’s fact. Anyone who claims “this time is different” has not been doing this very long. Most of us are in this to make money and the only way to do that is selling our winners. That means overcoming our attachment to our favorite positions and saying good enough is good enough. People who become irrationally attached to their favorite stocks inevitably hold too long. The dip that was supposed to bounce doesn’t bounce. But that is not a big deal because they just need to wait a little longer. A little bit later prices fell even further. But this happened before and they just need to keep waiting. Eventually prices fall so far that fear, regret, and hope are driving a person’s trading decisions. Actually “decision” is the wrong word, it would be more accurate to call it “indecision”. Remember, we’re in this to make money, not own stocks. We only make money when we sell our best positions. Don’t make the rookie mistake of holding too long. While some people will make staggering profits on AMZN and BTC, even more will watch eye-popping gains devolve into heartbreaking losses. The only way to avoid becoming one of those people is to sell your favorite positions. Premium Analysis: Every day during market hours. Includes my personal trades.